I was heartbroken to hear of the devastation that the Mexican beach destination of Los Cabos went through during Hurricane Odile earlier this year. THE ARCH: a natural landmark and UNESCO World Heritage Site, located where the Pacific Ocean and the Sea of Cortez meet. I am holding off putting up my blog post about my trip to Los Cabos until I have confirmed that all the properties that I visited have reopened, but I will say that I had such a wonderful time when I was there. 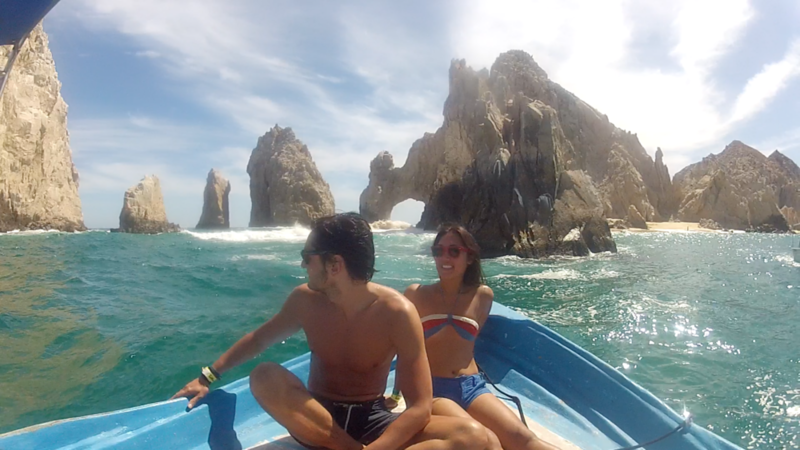 I've also been following Visit Los Cabos' social media hashtag #UNSTOPPABLE because honestly, they are. The community support and rebuilding efforts have been happening since day one. Getting things back to normal is going to take much longer than a few months, but it's definitely quickly recovering. I had lunch with Alonso Aguilar-Castillo, the General Director of The Los Cabos International Film Festival last week and I was happy to learn that Los Cabos International Film Festival taking place later this month on Nov. 12 to Nov. 16th, 2014 will mark the unofficial opening of Los Cabos as a tourism destination. Having lunch with Alonso Aguilar-Castillo, the General Director of The Los Cabos International Film Festival. If you haven't visited Los Cabos yet, visiting during the film festival would be a fantastic way to do it. Not only is it a great weekend to explore Los Cabos, Aeromexico and partnering hotels are offering discounts to festival goers. In its third year, Los Cabos International Film Festival is an event that offers not only a great number of national and international premieres in Mexico, it is also a fertile mixing ground for networking with producers, actors and other notable film industry guests. Los Cabos International Film Festival, is the first international film festival to take place at Los Cabos, Baja California Sur. The festival creates a space where cultural and commercial exchange can be made between the film industries of Mexico, United States and Canada. • The Festival will open on Wednesday, November 12 with Wild, starring Reese Witherspoon, who will also be in attendance to support the film's Latin American premiere. • On Saturday, November 15th, Rosario Dawson will attend Los Cabos International Film Festival to present the Latin American premiere of Atom Egoyan's The Captive and will have the honor to grant the Canadian tribute award to Mr. Egoyan himself. Dawson plays a detective in the film, which also stars Ryan Gosling. • The Los Cabos International Film Festival Tributes Program will feature a posthumous homage to Roger Ebert. As part of the tribute and as a testament to the relevance of his legacy, the Festival will also premiere the Steve James' documentary/Ebert biopic Life Itself, which celebrated its U.S. debut at Sundance earlier this year. As the festival's guest of honor, his late wife, Chaz Ebert, will be present to receive the tribute. Chaz remains active as Editor-in-Chief of the The Ebert Company and Ebert Productions. Tickets to the festival cost between $70-250, depending on how many screenings or galas you would like to attend. Aeromexico has also partnered with Los Cabos International Film Festival to offer additional discounts on fares to Los Cabos during the weekend of Nov. 12-16th. Partner hotels in the area are also offering 20% off their rates during this weekend as well. Los Cabos can be reached via air through the International Airport of San José del Cabo (SJD) receiving flights from several countries form Mexico, E.U and Canada. For more information, please visit: http://cabosfilmfestival.com/home/.